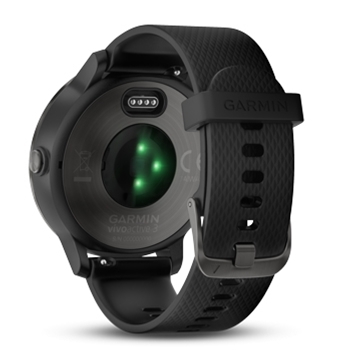 Garmin has a created a smartwatch that isn’t just for fitness alone. Lightweight and comfortable, the silicone strap is black and offers a slate bezel and is stylish enough to wear to the office, and straight to the gym, or out for a run. From a fitness standpoint you will have access to over 15 preloaded sport apps which now includes yoga, elliptical, rowing and stair climbing along with others for activities such as: Golf, Strength training, running, pool swimming and way more. Not one for structured gym or group workouts? Create your own app for even more customization. 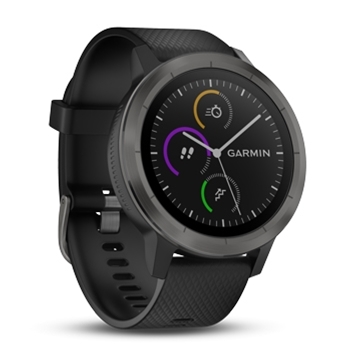 Simple connection with Garmin connect - a mobile app that lets you plan activities, and lets you monitor changes, set new goals and share your data with an online community is available when paired with your smartphone or at your desktop computer. The possibilities are endless for the plethora of activities that are available at the swipe of a finger. The vivoactive 3 GPS Smartwatch’s with built in Elevate heart rate wrist based monitor will keep you updated and let you see if it’s time to get moving, if you’re working at peak performance or if its time to take a rest! The vivoactive 3 even keeps you in the know of when your emotional stress level is causing elevated heart rate and allows you to manage that stress through the relaxation breathing timer. 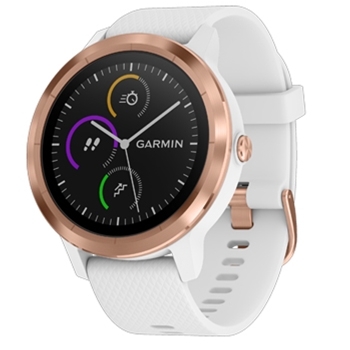 For the best features in a smartwatch, you’ll never want to be without your Vivoactive 3.